Six Moon Summer (Seasons of the Moon, #1) by S.M. Reine. Rylie's parents are going through a messy divorce. They send her to summer camp to get her out of the way of their fighting lawyers, but she's just as miserable at the girls' camp as she was at home-- there's nothing vegetarian for her to eat at the mess hall, she hates hiking and archery, and the other campers taunt Rylie mercilessly. One night, the bullying goes too far, and Rylie runs away. She doesn't get far. It's a full moon, and she isn't alone in the forest. A wild animal mauls her. She's certain she won't survive. Instead of dying, she wakes up unharmed in her cabin the next morning. The only sign that something has changed are the healed scars on her chest, her increasingly keen senses, and her sudden craving for raw, bloody meat. A boy from the other camp seems to know what's happening to her, but Rylie isn't sure if she can trust herself with Seth. Just when Rylie thinks that things can't get any worse--her parents are getting divorced and have dumped her at a summer camp far from the city she calls home--something terrible happens in the forests of Gray Mountain. Six Moon Summer is an amazing beginning to a new paranormal series. I was immediately drawn into this dark paranormal tale. Rylie is an outcast at the summer camp where her parents leave her while they finalize the messy details of their divorce. Cast aside by her family and her peers, Rylie finds solace in the pages of her journal. The nasty girls who bully her each day takes things too far though and Rylie finally runs away. Unfortunately Rylie doesn't find peace in the dark hills of Gray Mountain. Rylie is viciously attacked by a wolf, or at least she thinks she was, but she wakes up in her cabin the next morning with only old scars and the curious words of a mysterious boy to make her wonder what really happened. Author S.M. Reine creates building suspense with the terror and mystery of what might happen with each phase of the ever changing moon. An exciting new work of werewolf fiction with wonderful characters and an intriguing story. I can't wait to read the next book in the Seasons of the Moon series. **Side note: Rylie is described as having very pale blond hair, however the girl in the book cover pic has dark brown or black hair. I only mention this since I found the cover image to be distracting when creating my initial image of Rylie. 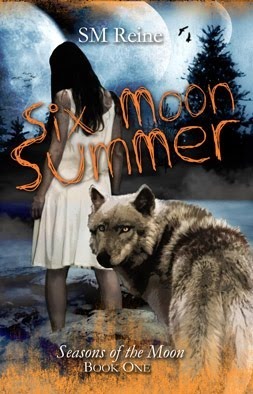 I recommend Six Moon Summer (Seasons of the Moon, #1) to readers of paranormal suspense, paranormal romance, young adult (though some scenes may be more suitable for older teens and adults), and especially to fans of werewolf fiction. Fans of the Wolves of Mercy Falls series (Shiver , Linger , Forever ) by Maggie Stiefvater, The Short Second Life of Bree Tanner by Stephenie Meyer, Firelight by Sophie Jordan, and Claire de Lune by Christine Johnson may enjoy this series. Don't miss our Q+A with author S.M. Reine June 2nd at From the Shadows! Six Moon Summer on Amazon . Six Moon Summer on Goodreads.